GROUND BREAKING … With the earth moved behind them, members of the Montpelier Board of Education, other staff, and village officials broke ground for its new recreation center. Work has begun on the complex that will also house new science labs at Montpelier School. School board members posed for a ceremonial photo May 2. Despite the rain in early May, Superintendent Grime was confident the school would be able to get all the dirt work done and concrete poured so work can begin on the inside by July. The project will cost $3,226,000. 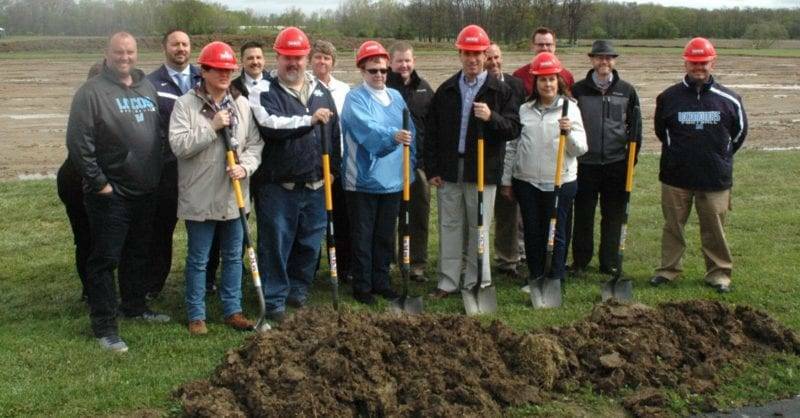 On hand for the groundbreaking May 2 were members of the Montpelier Exempted Village Schools Board of Education, teachers and other officials. Be the first to comment on "Montpelier Schools Break Ground On New Rec Center"